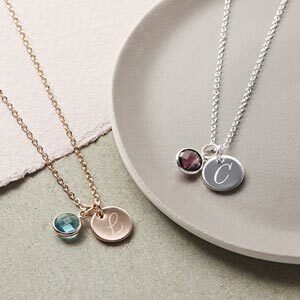 The Khloe personalised necklace is a beautiful large disc charm designed to be engraved with any name or message of your choice in our elegant calligraphy font. This large disc charm is the perfect platform to carry our alluring calligraphy font and the two combined is what created the Khloe personalised necklace. 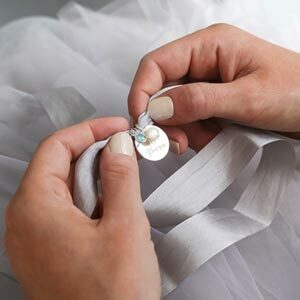 Envisioned as an ideal gift for a bridesmaids or other occasions where you may want to thank your closest friends with a classy addition to any jewellery collection. This exquisite combination of disc, trace chain and free flowing font can also be complemented by the addition of a Swarovski Crystal Birthstone. Amazing service, such quick delivery considering it was over Christmas period and had to be personalised! It arrived beaut and such a lovely box too for a birthday present for my bestie! She loved it! Excellent really please.l hope my granddaughter likes her xmas present. Really pretty necklace for my niece birthday she loves it. i got Beautiful Necklaces for my flowergirls. 5 Star. I need five necklaces and these are reasonably priced and are perfect as a thank you for my flower girls. Absolutely beautiful products, I adore all three of the necklaces I received, so personal and gorgeous and they are packaged so beautifully as well making them a perfect gift! Erreur de gravure sur le dos du collier Thank you for your feedback and I am so sorry to hear that you have received the incorrect items.